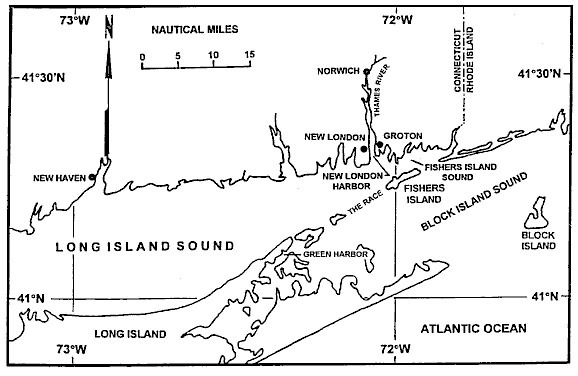 After touring the submarine center of Groton / New London in Connecticut, we headed inland from the coast and crossed the entire state of Rhode Island to arrive in Providence. This is not a long trip - about 55 miles. Rhode Island is only 37 miles wide "by the books" but that must be at the wide spot. I'd guess 25 miles is closer to the truth in the center. We were headed for the state Capitol. 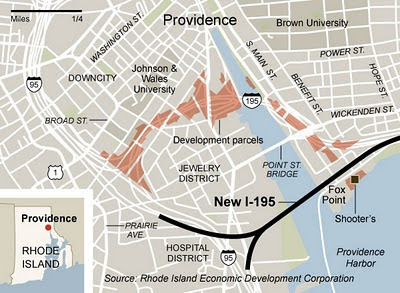 Providence is a city of about 170,000 within the city limits but is the center of a much larger metropolitan area that reaches across the border into Massachusetts. (Boston lies a mere 50 miles to the Northeast.) 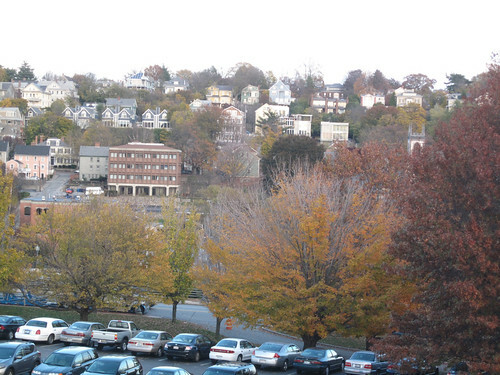 The Capitol building sits atop a hill with a nice view of the surrounding town. We circled the Capitol looking for a parking place. There was a concert scheduled for the evening nearby so both circling and parking were not simple. 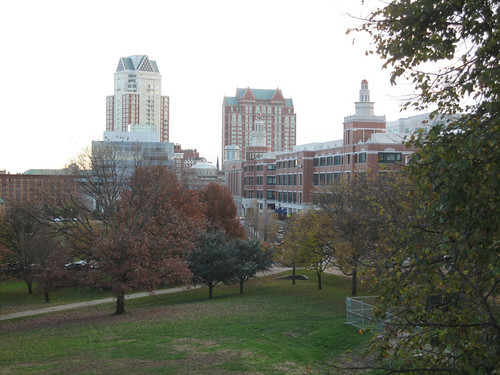 We eventually found a spot near Roger Williams park. 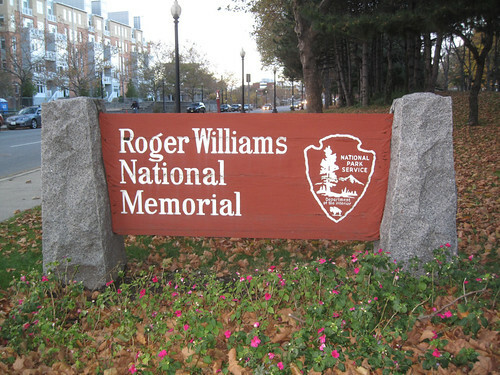 This soon led us to the discovery that this Roger Williams was not "Mr. Piano." Say "Roger Williams" in Rhode Island and you are talking about one of the settlers of the Providence plantation in 1636. Parks, statues, streets and even a university bear his name. 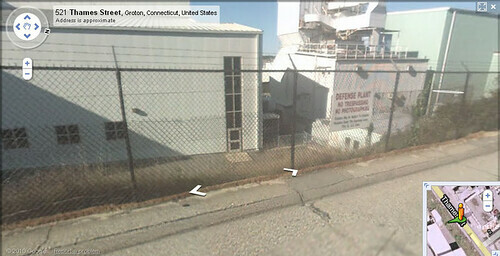 Industry is a bit scarce in Rhode Island. 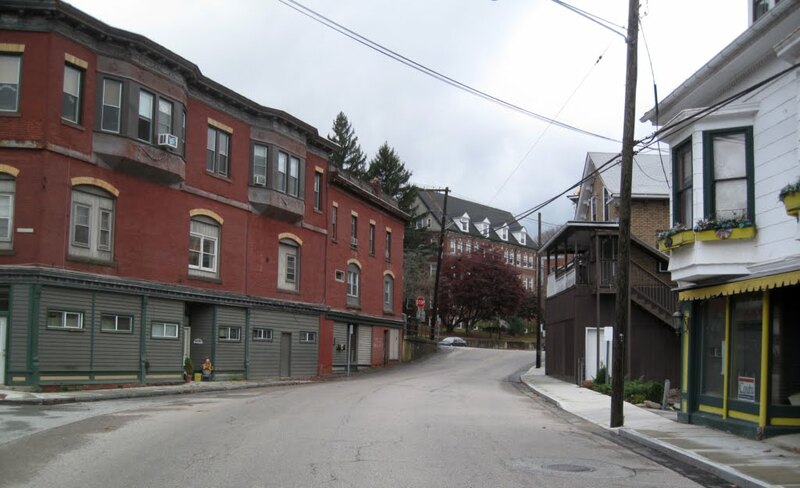 Once a textile center, that industry is long gone. 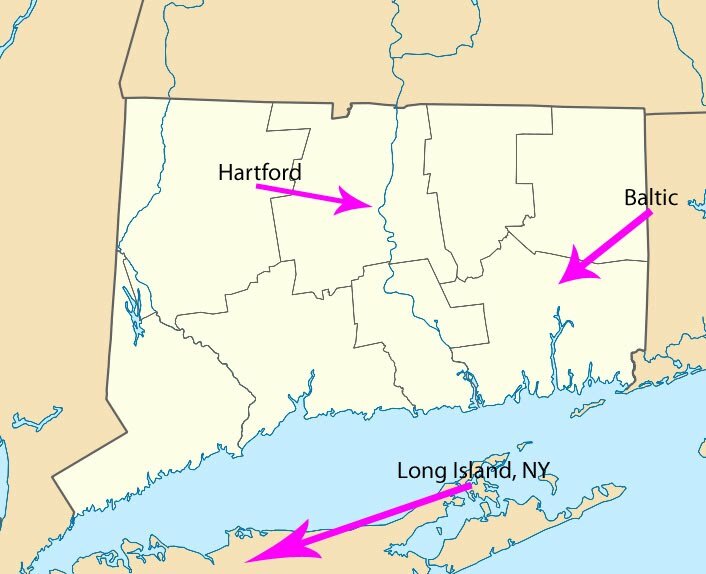 The local auditorium is called the Dunkin Donuts Center but Dunkin Donuts is headquartered in Quincy Massachusetts. Tourism is a big contributor to the state's economy and I'll highlight that in another post. Leaving Providence to return to Baltic Connecticut we encountered one of the rare "black holes" that my Garmin GPS can fall into. It seems that Interstate 195 has been relocated in Providence. 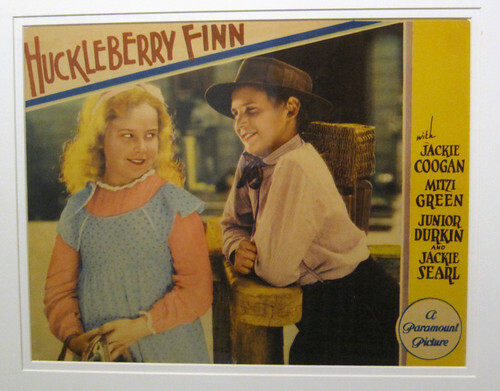 "Miss Garmin," as I call her, was quite confused by this. Heading along the freeway, she kept saying "turn left" and so forth. We ended up doing a loop around, confusing her again and then just ignored her until we were back onto highway 6 headed West. 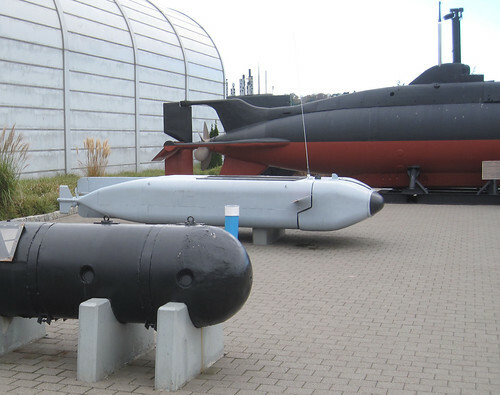 No visit to Connecticut would be complete without visiting the submarine museum in Groton. 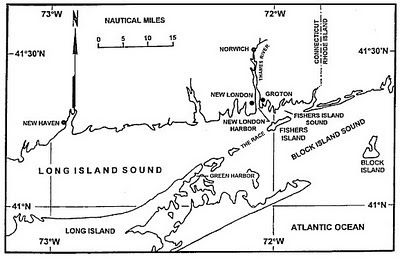 Groton is on the East bank of the Thames and New London is on the West bank. 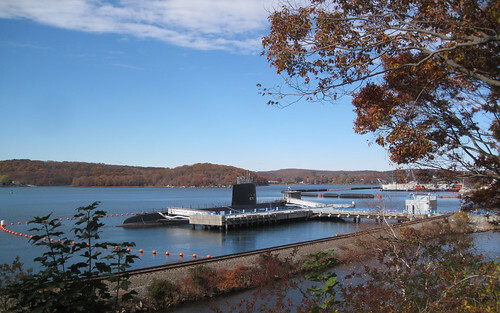 New London is home to the Navy's submarine base while Groton holds the "submarine factory." 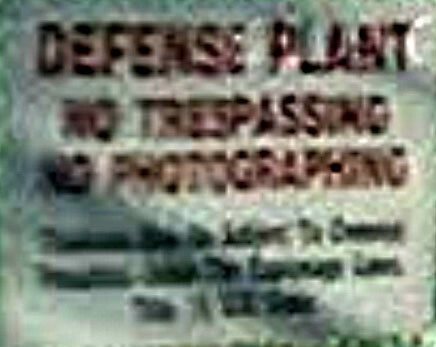 Fortunately, there is a public Library and Submarine Museum right on the harbor. 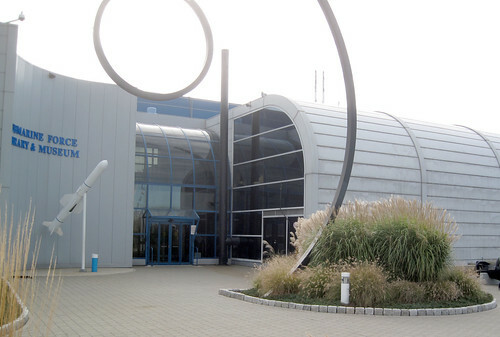 And the museum serves as the entrance to the submarine, Nautilus. This, you may recall, was the first Atomic powered submarine. For that matter, it was the first Atomic powered vehicle of any kind. Just up the road (East, toward Rhode Island) there is a great place to stop for a picture of the Nautilus. While we had the bad luck to arrive at a time when the Nautilus was closed for a few days, we did get to tour the museum. Inside, I ran into a very helpful submarine veteran. He and I got to chatting and he was telling me about Mamie Eisenhower christening the Nautilus in 1954. I told him I recalled the event from the newsreel pictures that I saw as a kid. He, of course topped that by pointing to himself in one of the pictures of the event. He claimed that Ike wasn't too happy about Mamie coming up to do the christening since it was only an "experimental" vessel. Wikipedia redirects "Grinder Sandwich" to Submarine Sandwich. Do more exploring and you can find some folks that claim a grinder should be a hot sandwich and should have crusty bread to distinguish it from a sub. 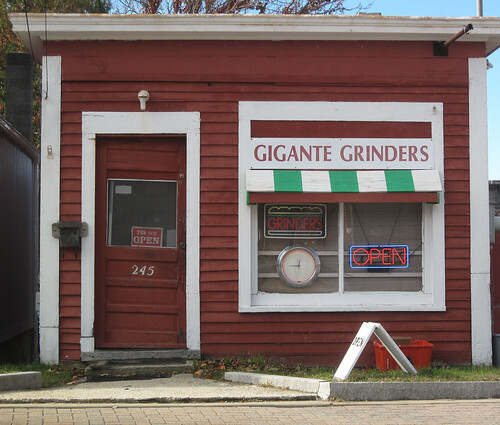 There are even some suggestions that a "grinder" was a slang term for an Italian dock worker. I'll leave it for others to explore the origins of the term but let's just note that this is the area with the submarine factory. It also holds a lot of people of Italian background. Odds are good that one of the jobs the Italians held involved grinding the welds on submarines. Make up your own story from there. 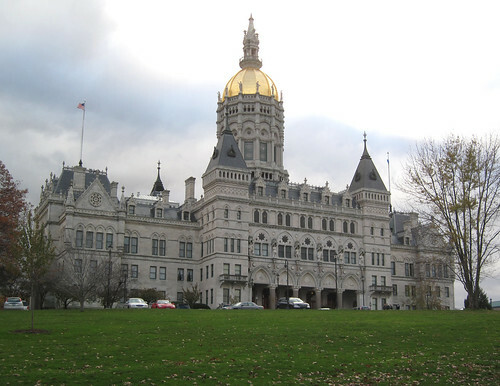 While we were visiting in Connecticut, we headed over to the state's capital, Hartford. 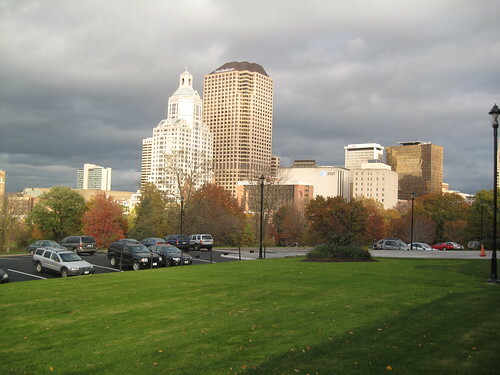 The greater Hartford area has over a million population and is home to many of the larger insurance companies. The Travelers, The Aetna and The Hartford, just to name three. 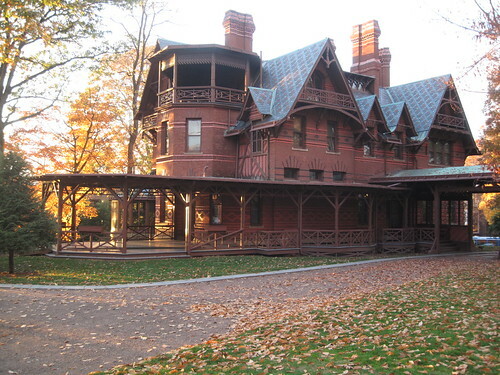 It also was home to Mark Twain, and as you can imagine, Twain's house has long been on my list of places to visit. But our first stop was at the State Capitol building. 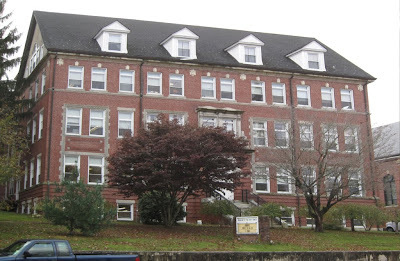 We arrived on Friday around 4:00 p.m. and were fortunate to find the building still open. The Capitol sits on a hill overlooking the city and has one of the better displays of historical memorabilia on the first floor. The building was pretty much empty except for a few security personnel and the Secretary of State's office where they were still dealing with the previous week's election problems. There are Revolutionary war treasures and Civil War treasures on the first floor. (Connecticut claims Ulysses S. Grant as a grandchild.) 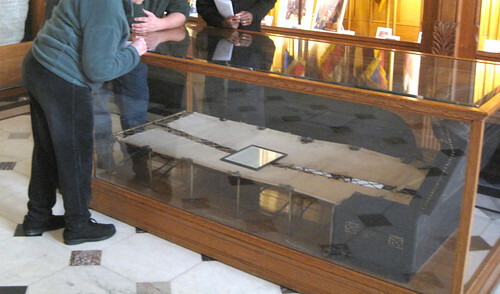 Many Northeastern states have a place or two that claim "George Washington slept here." 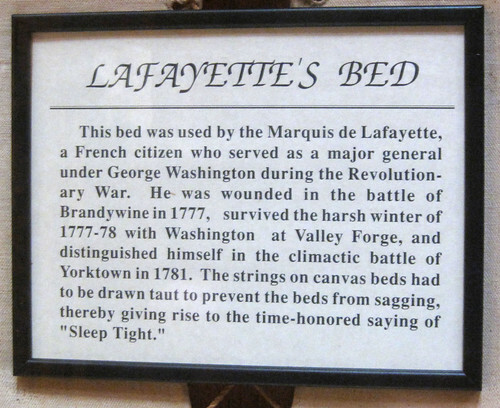 The Connecticut Capitol one-ups them by displaying General Lafayette's actual bed. 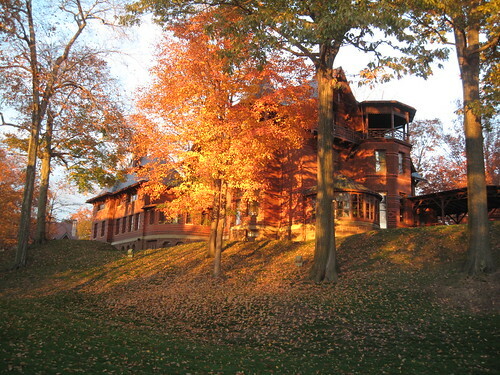 Attached to the home is a small museum. 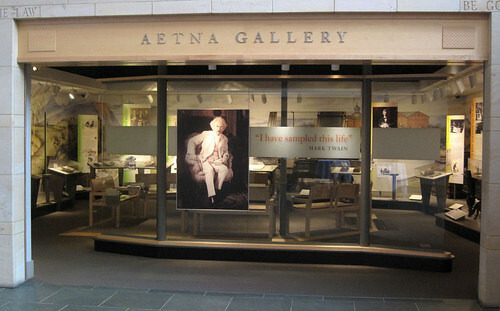 Here in the Aetna Gallery, they have saved the printing press that bankrupted Twain and put him off to France, living on a shoestring, for a period of time. 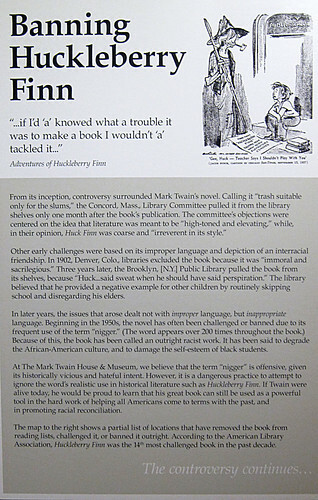 There's a display about the controversy that has raged over the years with regard to Huckleberry Finn. 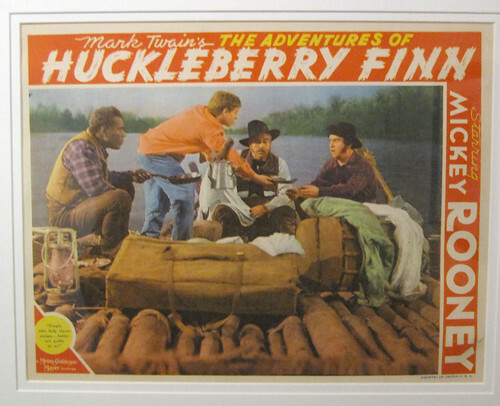 And a couple of posters to remind people of the movie versions of Finn that they may have seen. Last week Linda and I had Linda's mom and our son, Terry join us on a trip to Connecticut and Rhode Island. 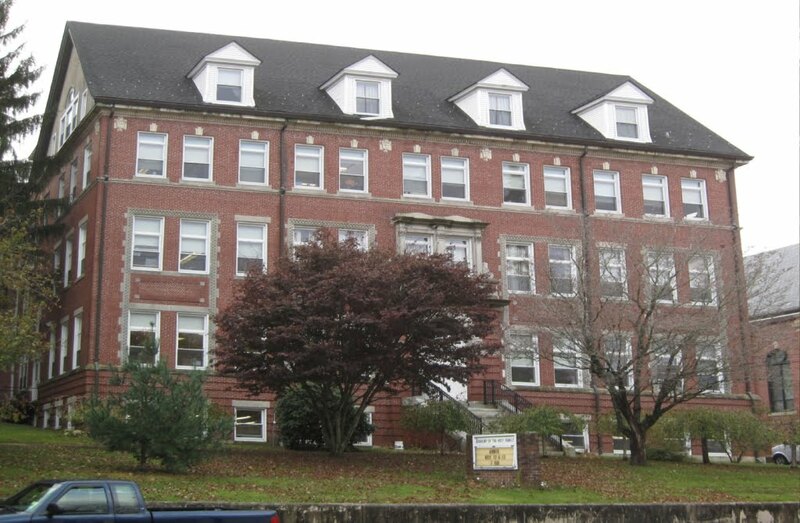 Our family has a friend who is a native of Burundi who is now a member of the Sisters of Charity and is currently residing in their convent in Baltic, Connecticut. A year or so ago, we had planned this as a driving trip to Wisconsin. I think the nun business is a bit like IBM (I've Been Moved) or the military. There was a transfer for Sister Elizabeth and a longer trip for us. The cheapest way to get to Baltic is to fly in to New York City (LaGuardia) and drive from there. 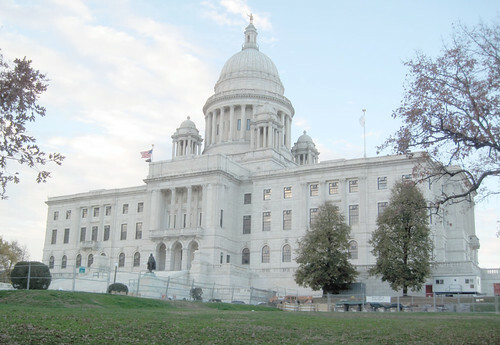 We had never visited Connecticut so it also offered us a chance to pick up between one and five state capitols for my photo album too. We headed out from Minneapolis and had the chance to experience the new TSA full-body scan procedures at MSP. We breezed through pretty easily and at least mom-in-law didn't get the usual going over for her artificial knees. I did get a an additional thorough pat-down after instructions were radioed from the scanner to my new best friend, the personal TSA agent. Yeah, those people who call it a "groping" have a good point! We beat the rush-hour traffic out of LaGuardia, paid a $5.50 toll to escape NYC and were soon in Connecticut. I stopped at the first services plaza on I-95 marked by Golden Arches to pick up some tourist information. The building had several fast food outlets and Terry stepped into a very slow-moving line at the McDonalds counter. After reaching the front of the line and being ignored for a couple of minutes, he waved his money in the air. The manager looked, yelled "whaaaat?" and then waved someone else over to take the order. We were still in greater NYC! Baltic, Connecticut, is a tiny village located in the larger town of Sprague. Total population of Sprague is 2,971. Baltic is about three hours drive from NYC and two hours from Boston. There is a small convenience store on Main Street that closes at 9:00 p.m. Otherwise, it appears that the Sisters of Charity are the major industry. Nearby Nowalk, about five miles away, is the nearest commercial center. Prior to becoming a convent, the building was hotel. This must have been quite the center of activity in the late 1800s. We enjoyed our stay in Baltic but most of our activities were in the surrounding areas. This was our first trip through the distant suburbs of New York City and Boston. It was much less populated than I expected. These tiny villages, farms surrounded by rock walls, and a general "New England Cottage" atmosphere made it a very pleasant place to visit. There are more pictures of the convent and the sisters' activities here on their website.